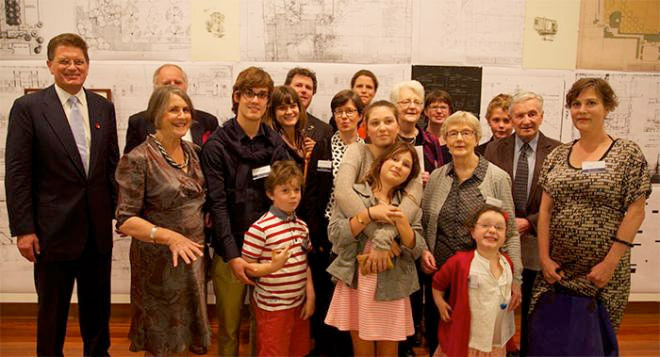 On Thursday November 7 a capacity crowd of family and friends, led by his widow Dr Dianne Tibbits (B.Sc, 1963) and his daughter Lucy Tibbits (B.PD, 1993 & B.Arch (Hons), 1996) filled the upper levels of the Ian Potter Museum of Art to remember George and to launch the George Tibbits Fund, with a goal of raising $150,000 to support the Faculty’s new building, and in doing so to name a studio in the building for this remarkable man. Not only was he a noted lecturer and researcher in his field of architecture, George was well known for his musical compositions and is still missed by the world of contemporary classical music. The gathering, hosted by Alumni President Associate Professor Peter Williams, began with recorded music by George, and continued with speeches by friends Allan Willingham and Bruce Trethowan, as well as Lucy Tibbits (for the family) and concluded with a rousing speech by long-term admirer and family friend, former Premier Ted Baillieu MP. Mr Baillieu exhorted the crowd to dig deep and remember George with their gifts as well as their thoughts. At the time of writing over $25,000 had been pledged to the Tibbits Fund. All enquiries should be directed to Andrew Middleton Advancement Manager for the Faculty, at miaj@unimelb.edu.au.